"There is Life In The Blood Of Jesus 4"
Welcome to "There is Life In The Blood Of Jesus"
The bible talks about the "Blood" from Genesis to Revelation. In Leviticus 17:7 we read about there is life in the blood of Jesus. Genesis 4:10 we see Abels blood crying out to God from the ground after Cain had murdered him. In Revelation 19:13 we see Jesus dressed in a robe which was dyed by dipping it in blood. Why, does the Bible always talk about blood, the blood? Because there is life in the blood, and it's through that blood that there is atonement is made for our souls. 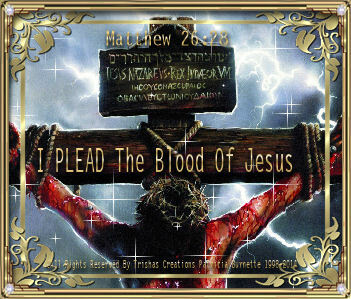 Hebrews 10:18, Christ's blood was shed for us to permanently atone for our sins. So, be happy because without the Blood of Jesus Our Lord and Savior we surely would be totally completely lost!